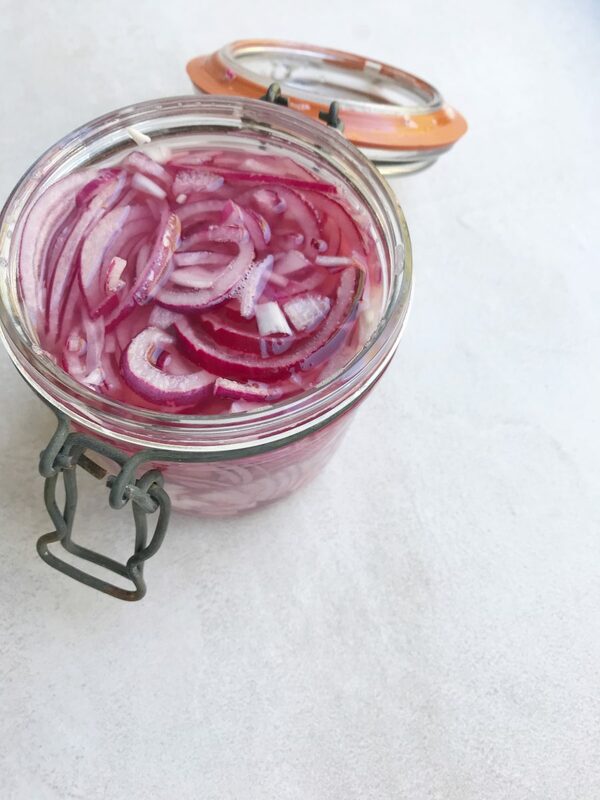 Living in a house full of boys there isn’t much pink in my life so I have to create space for it in my own way and this pink pickled onions recipe is not only delicious but perfectly pink. This easy pickle adds the most beautiful pink, acidic crunch to my tacos and I always have a jar in the fridge to top sandwiches and salads. A jar will last for weeks. The acidity of the vinegar takes the strength of the onion away, brings out the vibrancy of the pinkness and softens them. My grandma used to make sliced white onions in malt vinegar to go with our Sunday roast beef so I always think of her when I make this – she would be baffled by Mexican food but she subconsciously knew the importance of acidity in her cooking. Peel, half and slice the onion into half moons as thinly as you can manage (see my video here). Put the slices into a small jam jar or glass bowl. Heat the vinegar and salt in the microwave or a saucepan until it starts to bubble the turn the heat off. Pour the vinegar mixture over the onions. Stir so that the onion is submerged then leave for a few hours of a few weeks before serving. Use a fork to pull the onion out of the liquid before serving. Find more recipes for sauces/condiments, tacos and onions here.